With a strong cast, great atmosphere, and solid visual effects, “Stirring” is a loving an effective tribute to the best holiday slasher classics. 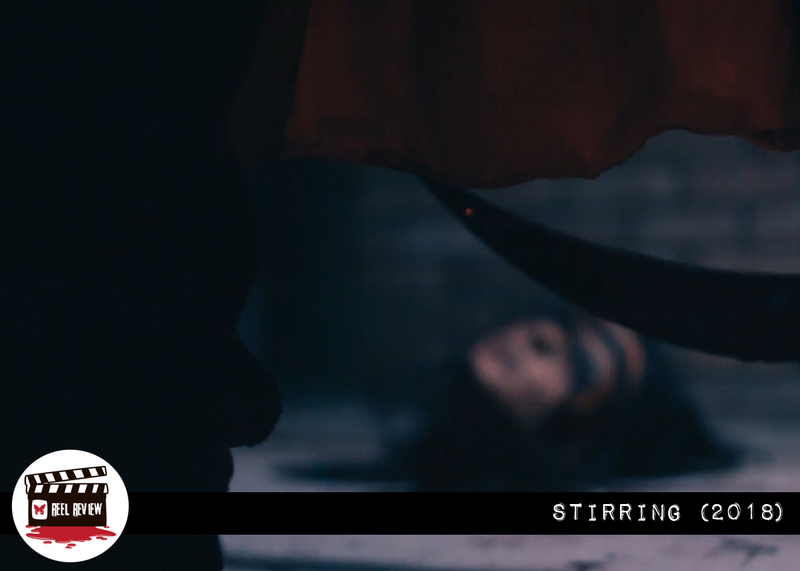 Stirring is about a group of college students attending a Christmas party at a sorority house with a bloody and sinister past who are stalked by a killer disguised as Mrs. Claus. I just love the way that plot sounds. Writer and director Troy Escamilla (Party Night) knows how to dress up his holiday horror, and Stirring is loaded with festive atmosphere. Holiday themed pillows, blankets, figurines, candles and decorative wall hangings and garland deck the halls of the doomed sorority house. 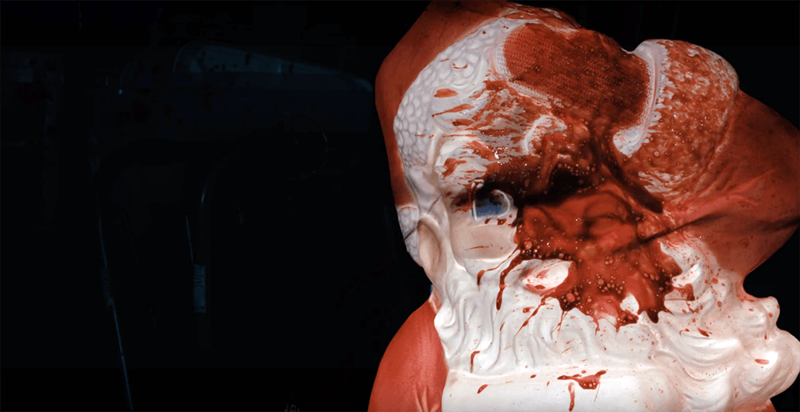 It’s a very warm and appropriate looking slasher that is drenched in Christmas and blood. All this holiday cheer is perfectly topped off with slow and eerie piano notes that make up the Christmas themed score. The music makes all the lights and decorations take on a new, unsettling appearance — giving the holiday a wonderfully twisted feel. 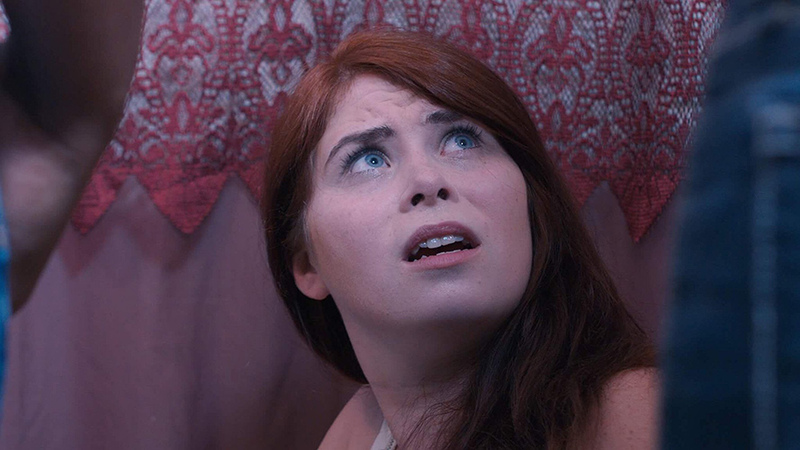 Stirring boasts a true ensemble cast who are very believable as college students. They look the right age, in addition to acting and talking like real college kids. 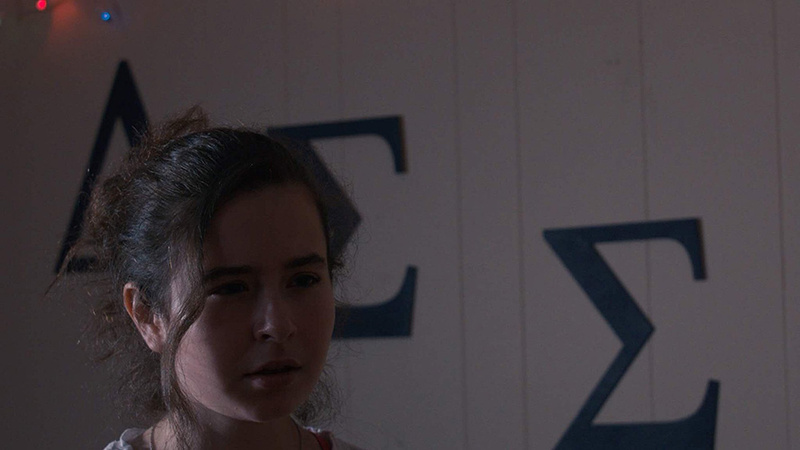 Hailey Strader as Danielle has a relatable, every girl look, and Heather Bounds as Kayla is really good as the sweet sorority girl who just wants to have a nice Christmas party. Billy Brannigan and Drew Shotwell also do great work here…especially Shotwell. The way he delivers his lines and reacts to other characters feels very natural; he doesn’t even seem like he’s acting. Adding to the fun are appearances from scream queen Brinke Stevens and Helene Udy, two slasher film favorites whose inclusion should make every horror fan happy. 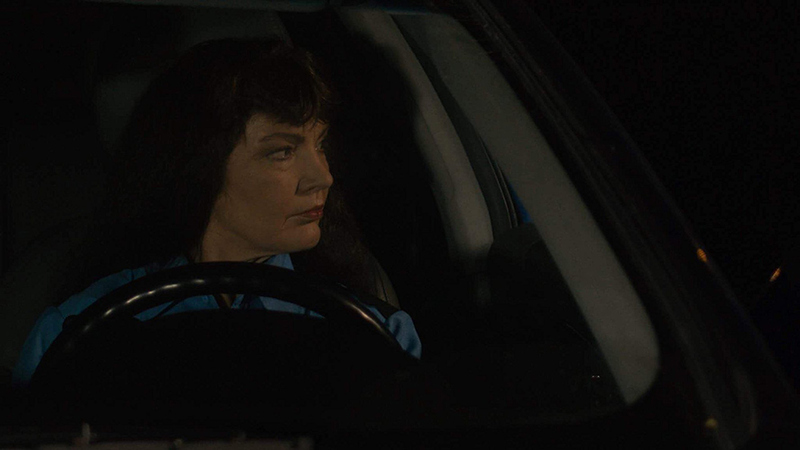 Udy has a lot of fun with her role, and Stevens is perfect as the campus patrol officer — with her icy cool voice and calm demeanor to uphold the rules. It’s just a blast to see them on screen together. Just like her work in Party Night, Heather Benson offers up top notch and very impressive special effects. She’s extremely talented. I love the creativity of the kills; a number of them incorporate holiday decorations. The kills and effects are sharp, fast and offer plenty of blood…but are never over the top. They are much in the same vein as Friday the 13th. 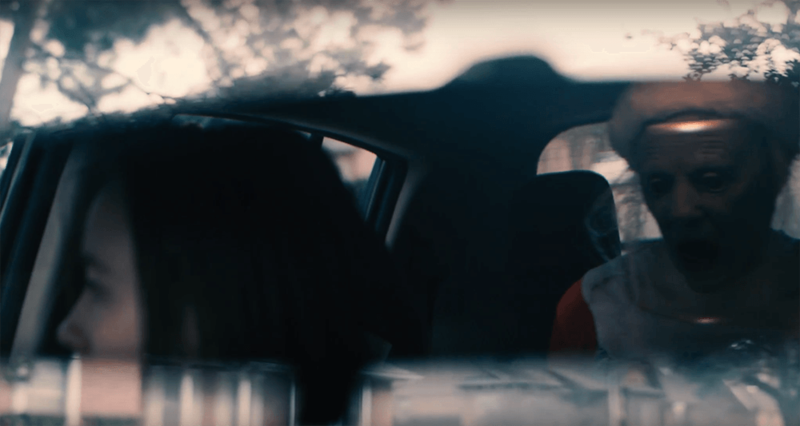 Another place Stirring succeeds where other films have failed is with the use of cell phones and texting as a means of communication to move the story forward. Text boxes are effectively displayed on screen as they pop up from the phones. But, more importantly, this type of communication doesn’t dominate the dynamic between the characters. While texts do pop up at important times in the story, the characters and their relationships are well established with plenty of physical and in person interaction. I think this is important to create relatable characters. In this increasingly digital world we live in, Stirring is one the best efforts I’ve seen that blends the two in an effective and smart way. My one criticism would be the ending feels a little more rushed than I would have liked. The well-crafted script takes its time to create solid characters and a deliver a nice, slow building tension as the story unfolds. In contrast, it felt a little underwhelming to have such a quick wrap up at the end. I suppose that criticism of wishing the film had a slightly longer finale hints at how much I enjoyed watching Stirring. The film is a love letter to the slasher hey day and such holiday horrors like Black Christmas and Silent Night, Deadly Night. Much like the holidays themselves, you don’t necessarily need anything unexpected in a slasher film. Between the nostalgia we feel at Christmas time and the nostalgia we feel from our favorite slasher films, Stirring effectively ties these tow beloved traditions together. The end result is a fun and familiar feeling horror flick: familiar in the way of seeing old family members during the holidays. And on that front, STIRRING delivers.